Image: Unidentified artist. 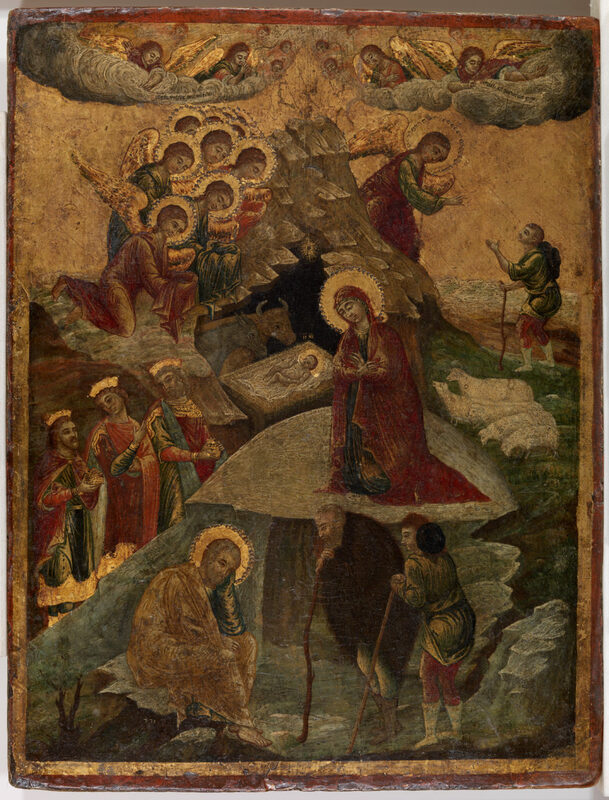 Nativity of Christ, 15th century. Oil (and tempera?) with gold leaf on panel, Overall: 17 3/8 x 13 1/4 in. (44.1 x 33.7 cm). BF362. Public Domain. Beautiful!! I esp. like this...Unguarded our own kingdoms lie As King of Kings descends on Earth, and this...Like toddlers on our knees we fall.It describes us perfectly! Hope you are having a very happy day. We are spending the first Christmas in our own home that our children can remember. We always spent it on the home farm where hubby grew up but my sister-in-law who lives there is recovering from foot-surgery and didn't feel up to it! We miss the tradition but are really enjoying a home-Christmas! Thank you, Janet :) It's been a lovely home-Christmas over here as well. No snow, but plenty of Christmas spirit. :) wish I could share our snow-plenty with you! p.s. the story of the shepherds stood out to me this year too for some reason! thank-you for sharing this poem!